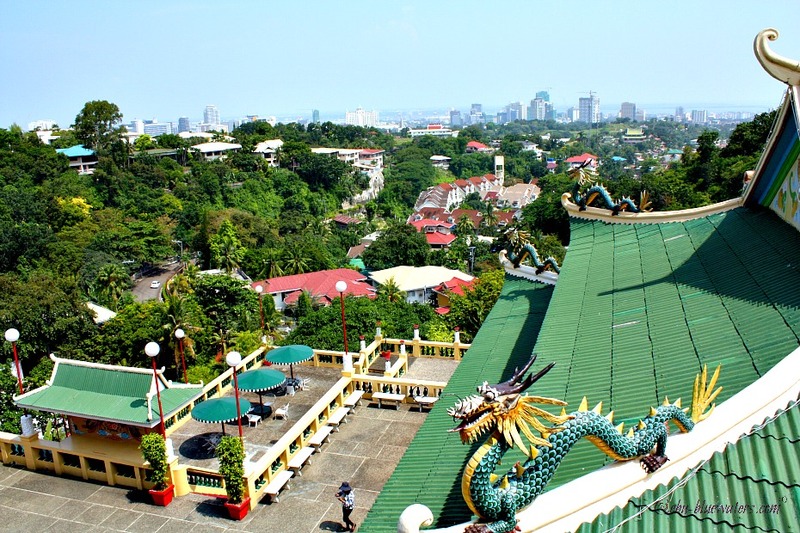 Cebu Taoist Temple is a famous religious site established by the hill in Cebu City. It is not a tourism destination, but it became popular due to its peculiar structure and artistic appeal even to non-believers of this religion. 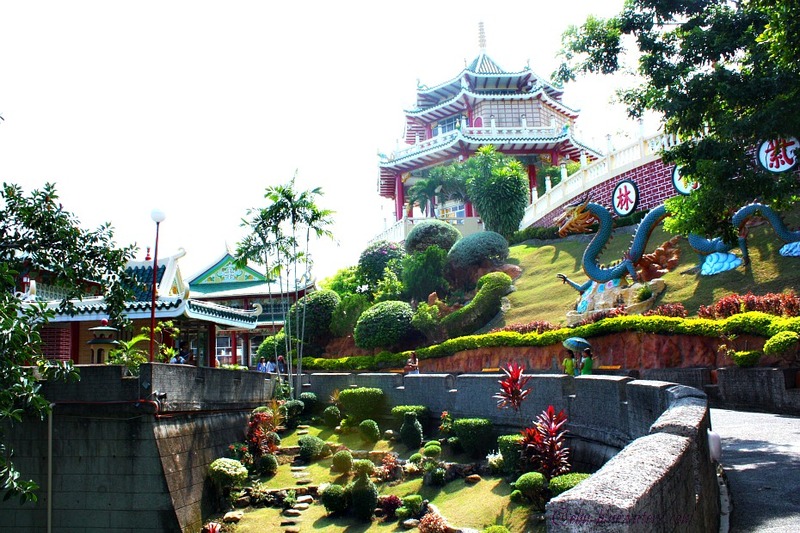 It is a Taoist Temple located in Beverly Hills Subdivision in Cebu City, Republic of the Philippines. 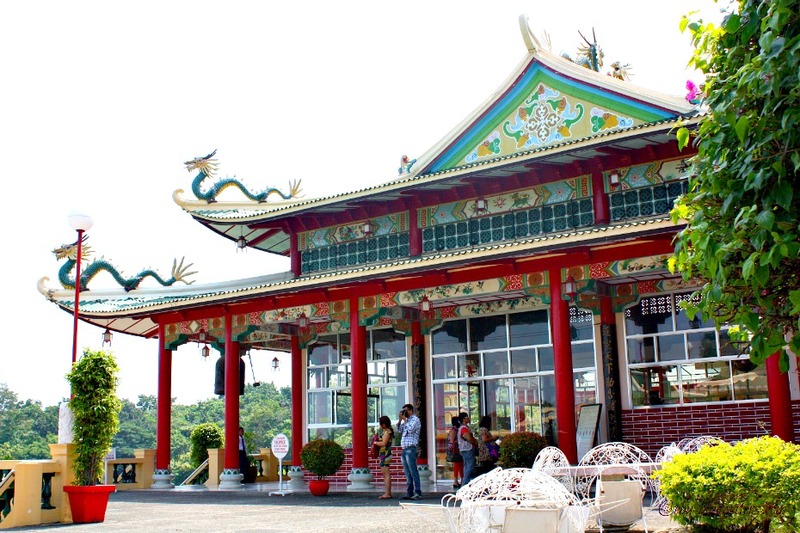 The Chinese Taoism community built the temple in 1972, with Chinese style architecture that cost them around two thousand US dollars by then. It overlooks the city giving you a beautiful panorama of the city skyline and the blue water dividing the capital and Mactan Island. 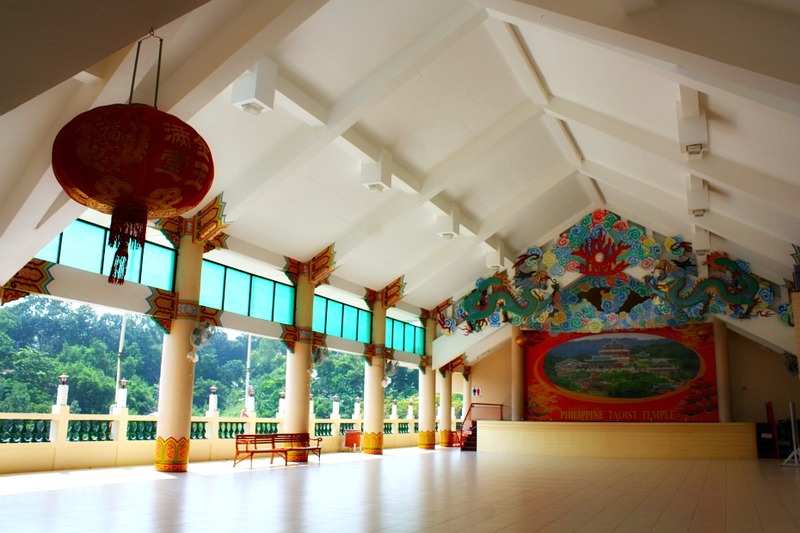 This temple is excellent for anybody who wants to get some fresh air and relax from the city. The site of the temples, religious figures, designs, dragons, and paintings can help you forget and even relieve your stress. Part of the healing effect when visiting the place is the open and relaxing green scenery that enveloped the site aside from its hillside gardens. Of course, if you believe in Taoism this is a perfect place for you to pray or meditate about your faith and life. And if you believe in something besides this religion, please make sure you show respect and behave appropriately within the area. Devotees of Taoism would certainly know what the 81 steps mean. As I have just learned, the 81 symbolizes or represents the 81 Chapters of Taoism scripture. It means that as you ascend through the levels, you are within the holy book of this religion. Just for a quick background of Taoism (only for those who doesn’t know), this religion was founded or based on the teachings of Lao Tze, an ancient Chinese philosopher. Since many centuries ago, Chinese traders and early Chinese immigrants of Cebu brought with them their Taoist belief and established this community. 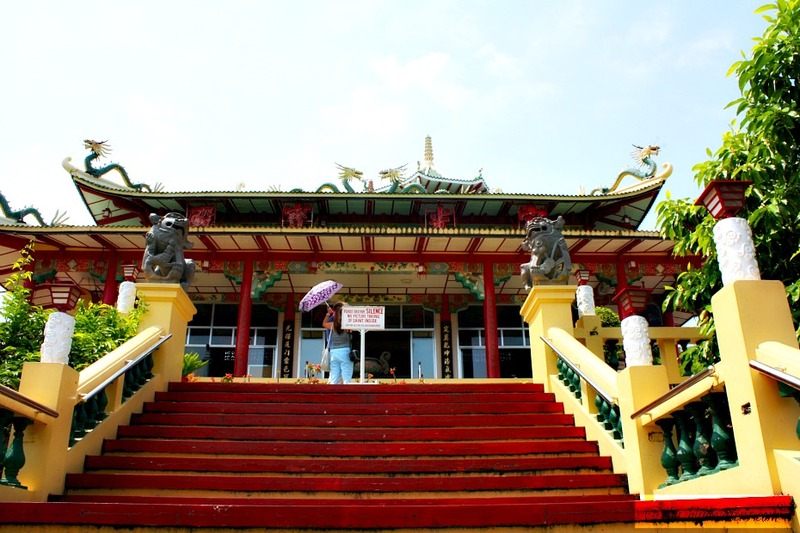 The development of this temple is through the efforts of Chinese people of Cebu. Most of them belong to prominent and business families. What is so unique about this site that appeals visitors cannot merely be described in just one or a few words. However, for the sake of giving you a background, I’ll be delighted to explain some of its features. The main entrance gate’s height, design, and colors, for me, is just striking and distinctive. It is not a typical sight in the province, that is dotted with Christian structures (and symbols), to see gates with intense red and green colors and dragons, intricate designs, symbols, Chinese characters, among other features. My recent visit (2 October 2015) to Cebu Taoist Temple precisely points me to this striking gate which prompted me to shoot my first photo of the site. I was just excited to have reached the place and took the photos. I asked the security guard underneath the shade of the gate and pointed me to take the other entrance. If you have problems with climbing stairs or steps, getting to the top of the temple could be a problem. That’s because you need to climb lots of steps to reach the main temple where the Taoist saints are located. This is the primary structure where the saints and other religious symbols and writings carefully set and positioned. Just like most religious structures, the symbols and statues are facing towards the worshiper's direction. Unlike the Christian churches and places of worship, maybe through cultural differences, this temple uses no benches or chairs but small and somewhat rectangular-shaped cushions that support one while kneeling (or sitting) down to make your supplications. Right above the main temple, there is another one above it. You can climb the steps at the right side of the main one, and it is on your left-hand side. It is smaller and has its own statue of a Taoist saint (you are not allowed to take a photo/picture of it). Actually, this temple is the most prominent one when you are looking at this site from a distance. The columns and walls have written Chinese characters describing the place and whatever it is intended to say (for those who cannot read or understand the language). This temple is with colorful paints and paintings depicting its religious meanings and background. Aside from the main worship temple, there are smaller worship structures to the right of the main one when facing towards that direction. As you face that temple described above, on its left-hand side you will see an impressive sight – a small pond and a fisherman. Actually, it is more of an aquarium being inhabited by Koi fish of different bright colors (golden, yellowish, etc.). 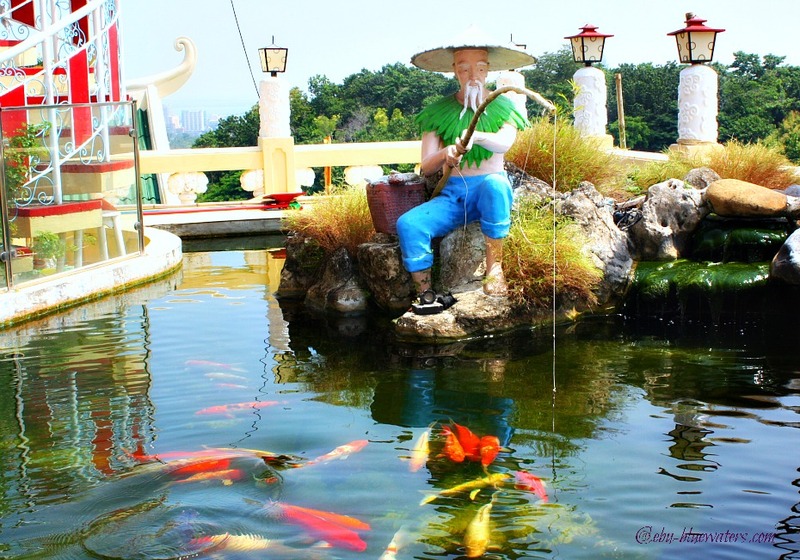 There at the center of the pond or aquarium, you will see the prominent sculpture of a Chinese-looking fisherman who is apparently trying to catch fish. Just don’t toss in coins there because you are not allowed to. There is a place where you can make wishes and then throw in your coins! To the right of this small temple (with your back facing towards the city) is another smaller but attractive structure with religious statues. In here, you will see water and a number of metallic jars where you can throw in some coins (allowed) after you make your wishes. This could be the wishing well, and you are allowed to take photos in this area including the religious sculptures as your background. Make your wishes here and toss in your coins! These dragons are very symbolic among Chinese people. Ancient Chinese dragons are symbols of energy (chi) and good fortune including great success, achievements, and prosperity. Due to those symbolic meanings, dragon paintings, carvings and other images representing dragons are apparently visible in Chinese temples, especially at this Taoist temple. The dragons are on top of the roofs (two-tiered roofing) covering the main temple, and you can have great views of them if you were around the smaller temple mentioned above. You will notice that these dragons seem to be guarding the main temple by occupying every four corners of the roofs. The most prominent dragon you can find on this site is not one of those on the rooftops. It is the one on the ground or hillside garden, which seemingly moving towards the main temple. If you want to rest, there are some places where you can take a break after climbing up the steps. Somewhere in the middle of the site as you ascend you will find benches facing the main temple. I believe you can bring with you some snacks (probably ‘lechons’ are not allowed) and make use of the tables with chairs and umbrellas located on the right side and below the main temple. Yes, they also have a souvenir shop but not quite visible. It is located within and by the right hand side of the big hall. You can purchase some symbols and small products related to Taoism as souvenirs or lucky charms. These important and emergency rooms are available behind the big hall’s left-hand side. I guess (80 percent) that it is for social and religious activities. This will be full during their feast day which falls on the 21st of October. As you can see in the photo, there is no decoration or anything hanging. However, it will be filled with colorful lanterns and candles when the feast is a few days approaching. But for me, although it looks empty it looks great! About two decades ago, we were at this place, and I have to reminisce the exact location and structure. I can only remember that I have been here and not exactly how it looked like before. That’s probably because there are many changes that are incorporated in the whole place (and not because I’m getting older!). Anyhow, I find the place very relaxing, entertaining and deeply spiritual. 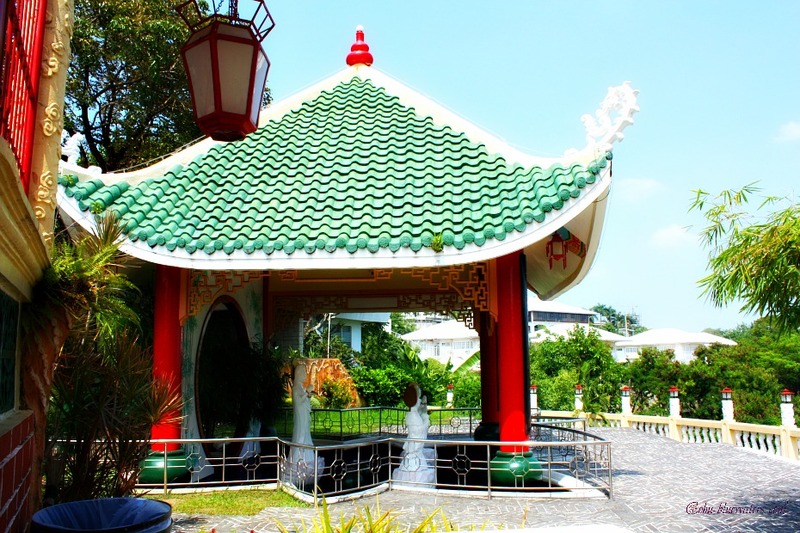 In other words, the Taoist Temple is really worth your time and effort. It is an excellent place for a family, friends or group. Since you are entering into a holy place, you are expected to respect the place by keeping the usual rules in religious sites. Yes, you are expected to be wearing a dress code. You are only allowed to get near if you are wearing sleeveless shirts and short pants. Silence should be kept at all time when inside the temple and even within the premises. I tried taking a photo of the inside and altar, but I was stopped by their guard who is watching everyone with cameras. You are only allowed to take from the side view but not directly towards the altar area. You have to observe a ceremony before you can enter the main temple. You will be asked to wash your hands and to leave your footwear outside. When inside the prayer area inside the temple, you may get a fortune stick and let the monk read it for you since it is in the Chinese language, that is if you cannot read Chinese characters. Or, you can also make your wish or prayers by throwing gently two wooden beach-shaped blocks on the floor. It is believed that your wish will be granted if both blocks face up, and if none or only one is face up then your request will not be given. You may do it again the next time you come by. A Taoist temple (traditional Chinese: 觀; simplified Chinese: 观; pinyin: guān, also 道观 dàoguān, literally "[place] where the Tao is observed/cultivated") is obviously a place where Taoism believers offer their supplications for almost everything, including health, prosperity, success, passing exams, safety, marriage, among everything. The temple is often called ‘gong’ (a palace), Guan or Miao in Chinese and where religious ceremonies are performed. The structure and function of a temple may vary according to the Taoist school in which the temple belongs to. In China, for example, ‘guān’ of Quanzhen School is a monastery where celibate Taoist priest – Daoshi (道士 "master of the Tao") live, pray and work. Taoist temples, of course, are scattered all over China (and over the world). Chinese people generally distinguished them into three kinds: palace-like temples, usual ordinary-looking temples, and simple huts or caves. They serve the same religious functions. 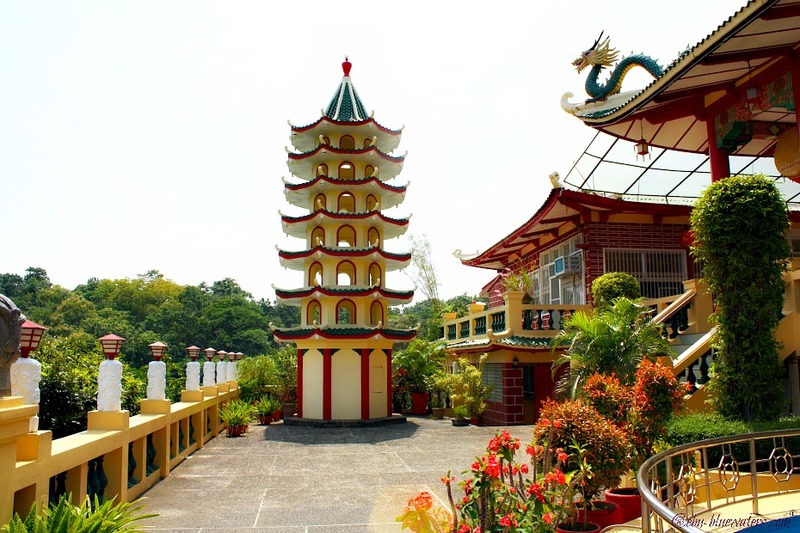 If you have noticed in Cebu Taoist Temple, there are so many symbolisms that are being reflected in the decorations, images, and constructions. It is the religious theme of Taoism the pursuit of longevity and prosperous life. You will notice that the construction of a temple is usually built with huge windows, wide open doors, eves, and girders are carved with Chinese characters. The carvings are Fu (blessing), shou (longevity), Ji (auspicious). Aside from that challenging characters (for non-Chinese readers or native-speakers), you will find it exciting and somehow wonder why they have animals and nature – real one or carvings. You can find turtles, bamboo, Kylin, dragon, Phoenix, and cypress. These all represent longevity, friendship, honor, warding off evils, and all good things. Also, you can find fish, bat, deer, sun, moon, stars, among others which symbolize riches, immortality, blessings, brightness (especially for sun, moon, and starts). One can realize that Taoism, like most religions in the world, is in-touched with the workings of the universe including nature, celestial bodies, symbolism, wisdom, and philosophy. By car, you can reach up to the main gate of the area where there is a checkpoint being manned by security guards. You will be checked and your vehicle since this is private property, then proceed further to find your parking space. By motorbike (habal-habal), you can hire a single motorbike down below (close and around JY Square Mall). It will cost you 10 pesos or so but not more than 20. To get to JY Square Mall, you can take a taxi or jeepney from SM City Cebu Mall with Lahug route. Just ask people where the Temple is and you will get a perfect guide. Specifically, you need to go the opulent Beverly Hills of Cebu where this charming place is established. Aside from the public vehicles, you can book a Day Tour service from any travel agency that offers tourism guides in Cebu City. And, if you are staying in a luxury hotel, you may get an offer as a guest for the temple trip. Big deal! Thanks and have a meditative day!